When planning your kitchen remodel, put thoughtful design to use and take advantage of the endless options modern cabinet design has to offer. 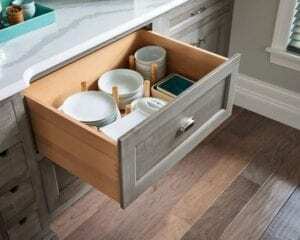 The newest cabinet accessories can make the most out of your storage space to create an optimal kitchen that is both functional and beautiful. Think about where you’ll use the items in your kitchen and store them accordingly. 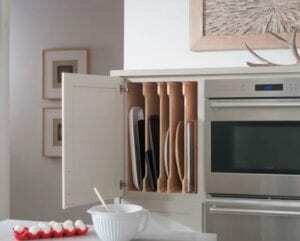 Reinvent your home with these practical storage solutions! Say goodbye to messy stacks of platters above the fridge! 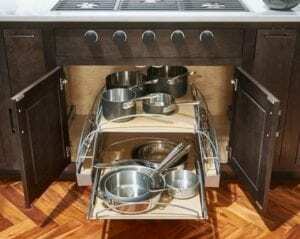 For one of the simplest ways to add organization to your kitchen, vertically “file” away cookie sheets, cutting boards, muffin tins and serving trays with a tray divider cabinet for more efficient storage and easy accessibility. Roll-out shelves make it easier to access hard-to-reach items at the back of a deep cabinet. In this option shown, the pull-out storage unit has 2 shelves and 2 side racks, providing generous space for a variety of cookware and lids. Never let another spatula stand in the way of getting your kitchen drawer open! 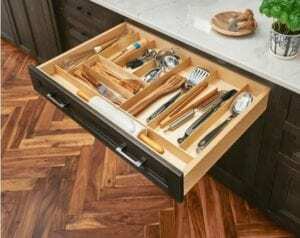 Cutlery dividers drop directly into the drawer for easy installation or removal, keeping keep your utensils neat and in order. 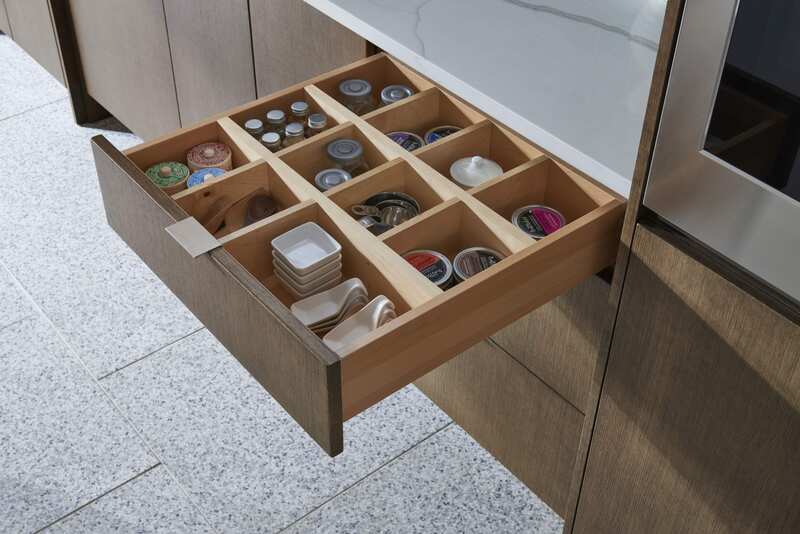 With customized organization, you can combine various inserts to optimize storage based on your utensils. 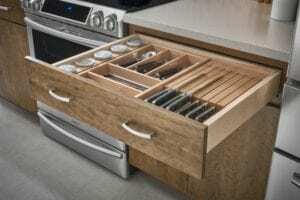 Free your counter of your knife block and store knives more safely in a drawer with protective solid hardwood slots. Instead of storing dishes overhead, you can stack them in a deep (9-12”) base cabinet drawer with the use of a peg board drawer organizer. A pegboard lines the floor of the drawer, while pegs are inserted to prevent dishes from sliding around when you open and close the drawer. Pegs can be rearranged to fit a new dish set. 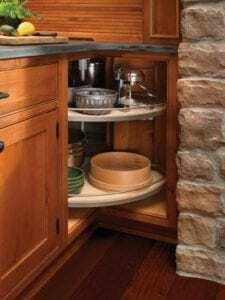 A lazy susan’s turntable shelves make the most out of storage for awkward corner cabinets – no blind corners with wasted space! 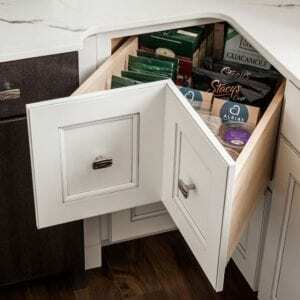 Alternatively, Medallion Cabinetry offers this corner drawer system for an innovative use of space. 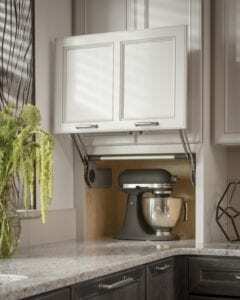 Another great option to clear clutter off counters is an appliance garage, designed to hide small appliances. These are great for a mixer and/or your toaster! 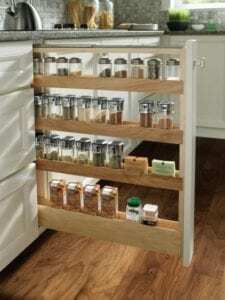 Thin, narrow cabinets can be the perfect place to store your spices or other small pantry staples. For optimal convenience, these are open on both sides and can be installed next to your range. Hide your waste bins behind a beautiful cabinet door! 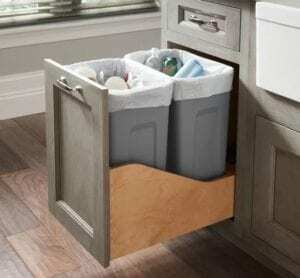 Built-in trash cans can be included in your kitchen design, and can be configured to include recycling bins or a compost caddy. Under the kitchen sink, where you normally find pipes, trash and a bevy of random cleaning supplies, can get a big upgrade and make cleaning easier with this caddy! The under-sink caddy has several compartments for spray bottles and sponges. All parts of the caddy are removable for easy transport of cleaning supplies – you can even throw them in the dishwasher! Come by Studio Home to discuss storage solutions for your kitchen remodel with one of our design consultants! For all the latest news, specials and promotions.